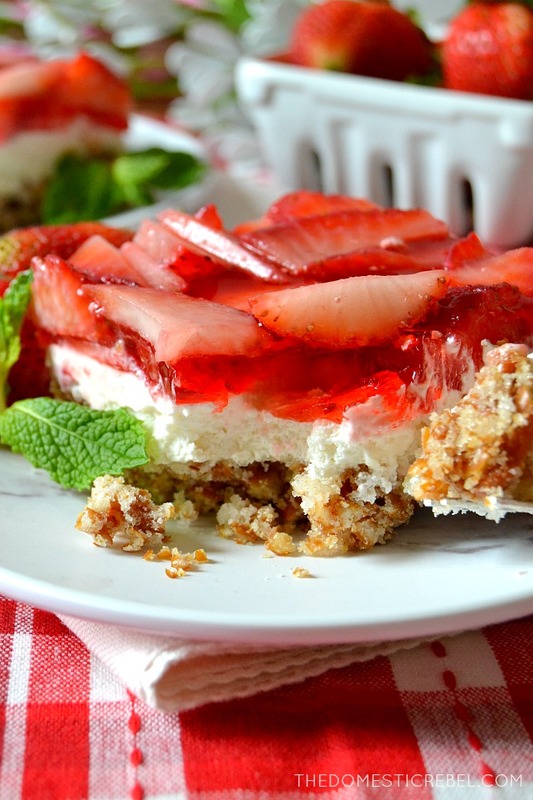 These cool and refreshing Strawberry Pretzel Salad Bars are a must-make for any upcoming summer get-together! Sweet and salty, creamy and smooth, everyone will go CRAZY for them! Call me a wacko, but I’m not the biggest strawberry fan. I know – that’s like saying I hate kittens or knock the walkers out from under elderly folks. I promise I’m not a monster! But to be frank, they aren’t my favorite berry. And they need to be zhushed up a little in order for me to like them. Case in point: my Strawberry Buttermilk Layer Cake, or my Best-Ever Strawberry Pie. Those recipes I ADORE. But a plain ol’ bowl of strawberries? Meh. 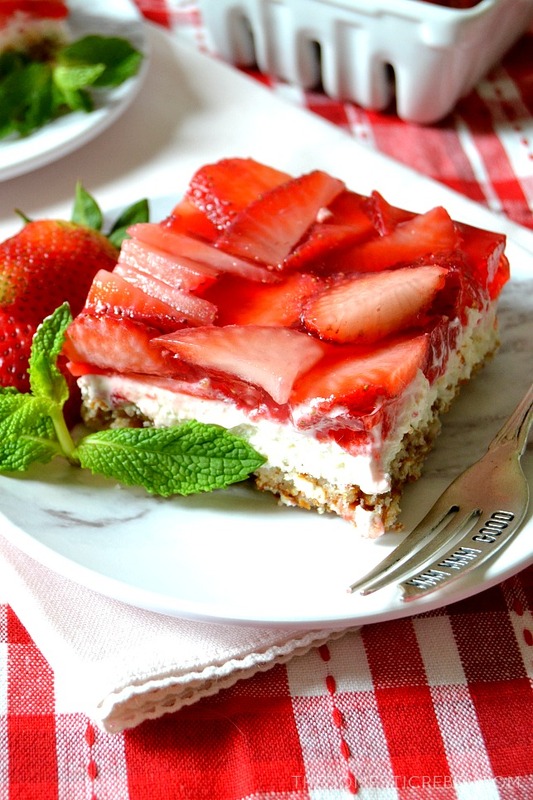 But then – THEN I made these Strawberry Pretzel Salad Bars and I think my mind has officially changed for good when it comes to America’s favorite berry. < actually, I do not know if that’s true, but I’m making wild assumptions and I’m okay with it. I am head-over-heels in LOVE with these bars. 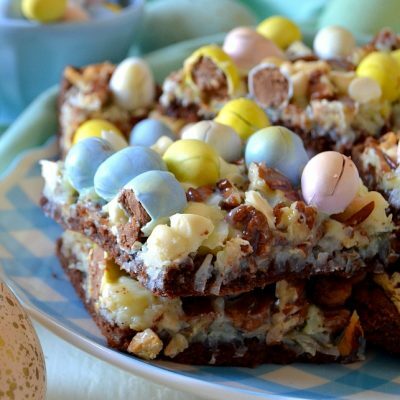 They’re a cross between a “salad” and a portable, easy to eat bar, and they’re fantastic. I’ve declared them the unofficial dessert of summer, so you heard it here first! They start with a pretzel crust, which is just some coarsely crushed pretzels (any style! ), a little sugar, and some melted butter. Toss it all together until it’s moistened, then pour and press it into a 9×13 baking dish. Your next step is up to you: you can either bake the crust to set it (preferred method), or if it’s hotter than Hades outside and turning on your oven sounds about as pleasant as getting a root canal while wide awake, you can freeze it instead and that will firm up the crust. Your choice, but if possible, I recommend baking it to really set that crust in place. Let the crust cool for a beat and make your Jello mixture. You simply combine the Jello powder and some boiling water and let it dissolve and cool off for a bit. 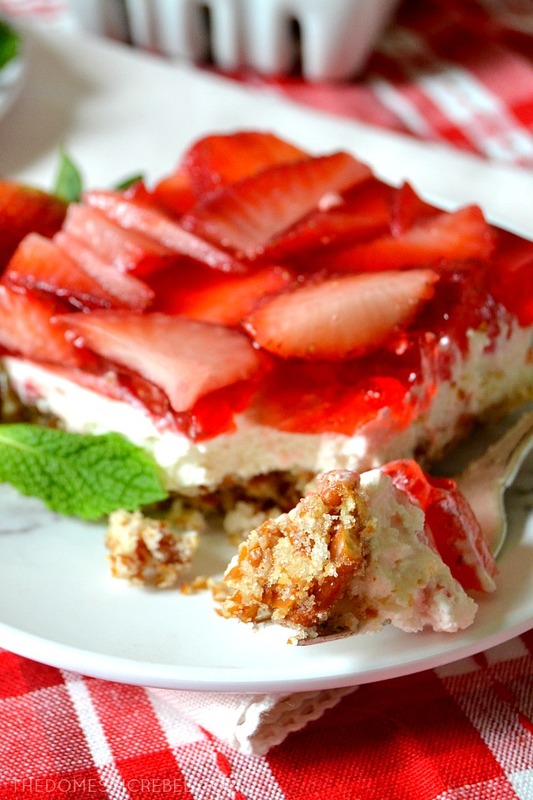 While it cools, cut up your strawberries into slivers or chunks – up to you! Then you’ll move onto the filling, aka, my favorite part! The filling is a mixture of cream cheese, sugar, a splash of vanilla, and some whipped topping to make it light, fluffy and airy in texture. Then it’s time to assemble! 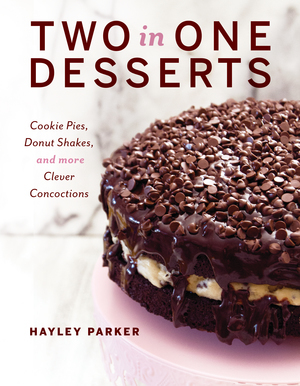 You’ll spread the creamy cheesecake-y filling over the cooled pretzel crust in an even layer, spreading it all around the layer as if to create a “seal” so the Jello mixture doesn’t seep down into the pretzel layer. If it does, no biggie – but this makes the layers extra pretty and impressive. 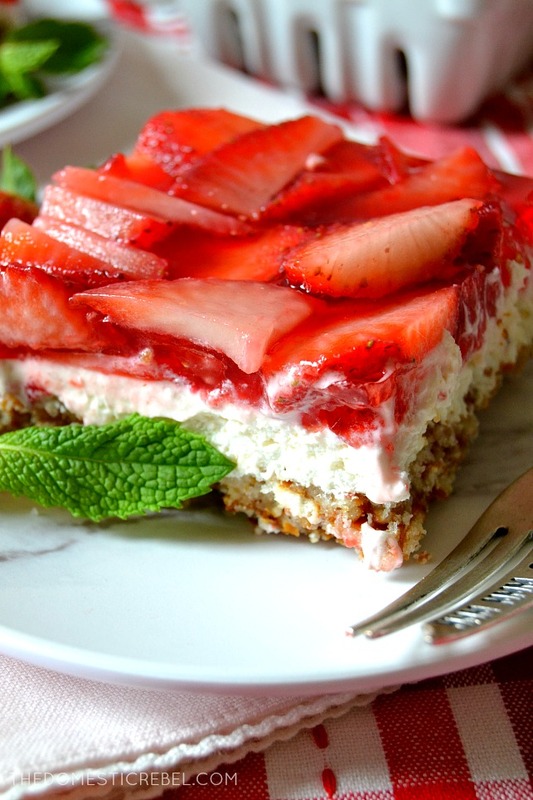 Toss the Jello mixture and the strawberries together and gently pour it evenly over the top of the cream cheese layer. 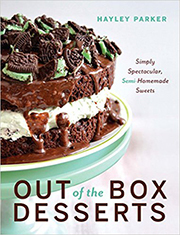 The hardest part is waiting for this to set up, but it’s a must because it allows the Jello layer to set completely, but also allows all the flavors to meld together and makes it easier for you to cut into squares. The result is a sweet and salty, crunchy and creamy, smooth and fresh dessert that will feed and please a crowd! 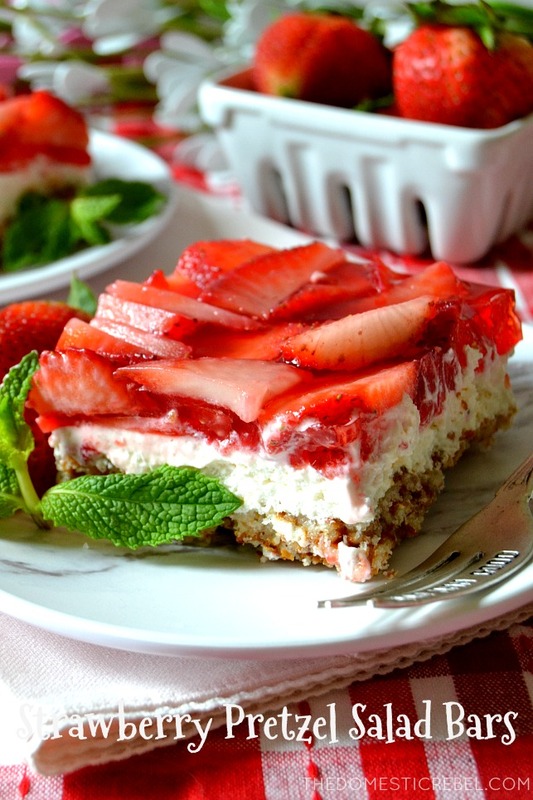 These Strawberry Pretzel Salad Bars are cool, creamy, refreshing, crunchy, sweet and salty goodness in every bite! Great for feeding and pleasing a crowd! Preheat oven to 350 degrees F. Liberally grease a 9x13 rectangular baking dish with cooking spray. In a large bowl, combine the crushed pretzels, sugar, and melted butter and toss until moistened and combined. Pour and press the mixture evenly into the bottom of the pan. Bake for 10 minutes or until set, then remove from the oven and cool. ALTERNATELY, you can omit the oven baking and freeze the mixture in the pan for 30 minutes or until set. In another large bowl, whisk together the strawberry gelatin and boiling water until dissolved. Cool for 15 minutes. Lastly, in a large bowl, combine the cream cheese, sugar, and vanilla. Using an electric mixer, beat the mixture until smooth, about 2 minutes. Fold in the whipped topping until combined and smooth. To assemble: Spread the cheesecake mixture evenly over the pretzel crust, completely spreading to the edges of the pan to create a "seal" so the Jello mixture is less likely to seep into the pretzel crust. Add the strawberries to the Jello mixture and stir to combine. Gently pour the Jello mixture evenly over the cheesecake layer and spread out evenly. Cover and refrigerate the pan for 4-6 hours or until set before cutting into bars. I hope you love these bars as much as I do! I got this recipe in ’91, it is one of the best dessets/ salads ever. In fact, I just made this last week. I baked the crust for 10 min, cooled it, then put it in the freezer while I whipped up the filling. I like a little more filling so I did 1 1/2 the amount. I also used two small pks of jello with the same amount of water and the strawberries were mixed in the jello. Then I put whipped cream with more strawberries on top. DELICIOUS Next time I might add a few chopped pecans in with the pretzels to see how we like it. I have also made this using orange jello and drained pineapple. That was also good but we did prefer the strawberry dessert best. The sweet-salty crust is wonderful with this. Lin, I am so happy to hear you loved these bars! They’re so easy and I love the idea of the pineapple/orange Jello as well!